This soup is a popular light meal in Thailand, and often sold by "stop me and buy one" hawkers who pedal tricycles around the streets. The traditional form is made from beef offal, and contains cow's blood. However the dish can be made quite well from any cut of beef, and the blood can be omitted, or replaced as in this version, by red wine. The noodles should be cut into handleable pieces so that they can be eaten with a spoon. Break the bones with a hammer, and roast them for 15 minutes in a hot oven. Bring the water to a boil, and add the vegetables and the bones to the pot. Boil gently for an hour. Boil vigorously to reduce to about half the volume you started with. Allow to cool, skim off the fat, filter through a fine seive. Soak the noodles for 15 minutes, and then chop them into 2-3" long pieces for ease of eating. Heat the stock to a gentle simmer, and add the wine, and all the other ingredients except the beef, mushrooms and noodles. When the stock is again boiling add the beef and simmer until the beef is tender. Add the mushrooms and noodles, and cook for a further 1-2 minutes. 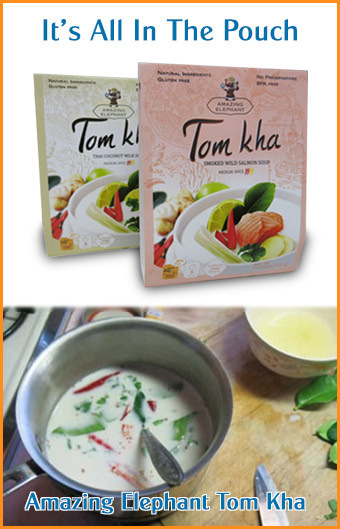 Garnish with a few coriander leaves and serve with the nam jim described below. This sauce will keep indefinitely. Heat the water, fish sauce and vinegar, and dissolve the sugar. Allow to cool, and then add all the ingredients to a food processor and process to a smooth paste. If you prefer a thinner consistency you can increase the amounts of water, fish sauce and vinegar. It may have changed since the late 60s when I lived in Bangkok as a teenager, but I never saw any Kuaitiao Neua vendor with red wine to use in his/her soup. And my brother and I often hit the markets/noodle carts early because we loved that classic Thai dish so much. Red wine gives the stock color and acidity. This recipe is about as authentic as it gets. I love condiments and like to add nam-som, dark soy sauce, fried garlic and sugar!! Just like how Grandma used to cook for us!! Roasting the bones will give color to the stock. No other recipe I've seen ever calls for wine. Beef or pork blood at serving will also add color and richness.